Take advantage of our shirt promo! 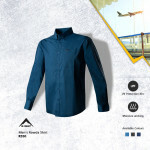 Buy one K-Way shirt and get 50% off the second! As functional as it is suitable for dressing up, our tech shirts are perfect for the office, travel and outdoors..